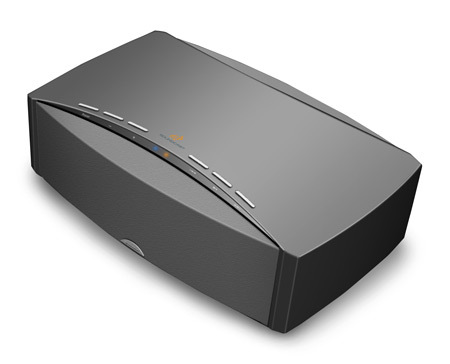 Soundcast Systems has introduced two products ‚Äì SpeakerCast and OutCast ‚Äì designed to offer the highest-quality wireless transmission from digital music players or personal computers to any room in your house or even outdoors. Soundcast‚Äôs SpeakerCast, above, is a high performance stereo speaker system using Soundcast wireless technology to receive music from an iPod when it is placed in the included Soundcast iCast wireless dock. The OutCast is an all-weather full-range, battery/AC operated wireless speaker system for outdoor use. It also includes the Soundcast iCast wireless dock. SpeakerCast and OutCast can link your iPod or other music source to a distant location. Each speaker system is fully self contained with internal amplification, full range speaker complements and the Soundcast receiver. SpeakerCast is a small, amplified stereo speaker enclosure incorporating two 3‚Äù full range drivers, a 50 watt per channel digital amplifier, and the Soundcast receiver. Power is supplied by the internal AC power supply. The initial version, to be released during the second quarter of 2007, will include the iCast transmitter and be oriented to the needs of the Apple iPod owner. The iCast version of SpeakerCast will feature pause/play and track forward/track back controls for remote operation of the iPod. The included remote also has these features, plus on/off, muting, and volume up/down. Later versions of SpeakerCast will include a universal AudioCast transmitter for use with other music sources such as computers and other MP3 players. OutCast is an all weather outdoor speaker system designed to provide high performance full range music in the yard or patio. It features an 8‚Äù downward firing woofer, four 3‚Äù high frequency drivers in an omni-directional array, a 100 watt digital amplifier and the Soundcast receiver. The OutCast is made of water resistant plastic and is designed to operate for up to 10 hours on the built-in, rechargeable battery pack. It has an internal AC power supply that can recharge the NiMH battery pack and operate the OutCast at the same time. The initial version of OutCast will include the iCast transmitter and be oriented to iPod users. This version of OutCast also has buttons for pause/play and track forward/track back for remote iPod operation. All OutCasts have controls for volume, on/off, and mood lighting. There is also an input jack for direct connection of an MP3 player, which should very useful during social gatherings when guests might wish to play music from their personal players. All Soundcast products can transmit signals up to a distance of 150 feet through multiple rooms indoors, and over 350 feet outdoors. Soundcast systems co-exist with other devices operating in the 2.4GHz band, including Bluetooth, 802.11 and related products. As many as three Soundcast systems can operate in close proximity. By achieving this level of quality of service, Each Soundcast transmitter can operate with two receivers, allowing the creation of multi-zone systems. SpeakerCast will be available during the second quarter of 2007 with a targeted retail of $399. OutCast should arrive at the same time and retail for $499. Other versions are slated for release late in the second quarter of 2007.